I learned this from training dogs to run blinds for the field but the principal applies to all dog training. When starting blind retrieves: It is better to go wrong right than right wrong because if you go wrong right long enough soon enough the dog will go right right. 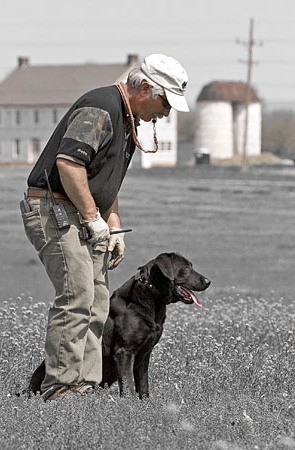 When you first start to do blind retrieves with dogs there is a tension or balance required between working to get the correct initial line before you send and keeping the dog’s attitude positive about the project. I have found over the years if you work hard to get the perfect initial line on the blind the dog is often very unsure when you finally send him. How does that happen? Let’s look at the set up to send the dog on the blind. You heel up and sit the dog looking out in the field. He has some idea you are going to send for a blind but no idea where it is. He is looking to the left so you pull him to the right, telling him in effect not to go where he was looking. Now he is looking too far to the right so you push him left, telling him not to go where he was looking and so on until you have him lined up just where you want him and then you send him. The trouble is now you have told him many places “not to go” in the field. Many young dogs loose confidence right there. When sent they leave tentatively, unsure of where they are supposed to go, but very sure there are many places in the field they are not supposed to go. Which brings me to my axiom It is better to go wrong right than right wrong because if you go wrong right long enough soon enough the dog will go right right. It is better to send the dog with the wrong initial line but still possessing the right attitude than to insist on getting the right line and end up getting the wrong attitude. When your dog is learning to run blinds if he has the wrong line but right attitude the lines will improve over time. The day will come when you have the right initial line and the right attitude. I have not found the reverse to be true. If your dog is learning to run blinds and you work very hard to get the perfect initial line and in so doing ruin his initial attitude about blinds the attitude does not improve with practice In fact with practice your dog becomes more and more convinced that he doesn’t like blinds. This same axiom applies to dogs when learning new actions/commands/behaviors in other venues. Attitude is almost paramount. One of the main focuses of this blog will be Retriever Training in Drive. This is an example of doing a “yard drill”a dog working in retrieve drive. This clip demonstrates a high level of control in the presence of available reward and distraction from a dog that is a willing participant in the training. I will break out an list a variety of skills from this clip and explain how they were taught with drive rather than through pressure. This dog is working “in drive” with an electronic training collar. He is working with a two fold expectation. He knows that he can by his actions make “retrieve happen” and he can turn off the e-collar.